The SVS Single Vertical Saw simplifies the removal of the third side of a log during processing. Placed in the line behind the TVS, the SVS prepares the cant to move on to the resaw. The SVS has a maximum cut width of 300mm. The maximum material size is 400mm wide by 250mm high. The SVS is fitted with infeed and outfeed roller tables. A steel spiked chain belt moves material through the blade up to 25 metres per minute. With the standard laser, the operator can align the cant precisely for maximum recovery before pushing it onto the moving chain feed. Roller hold-downs make sure the log remains straight during cutting. The SVS can also be used to take one side off a slab, which can then be passed to a horizontal resaw. 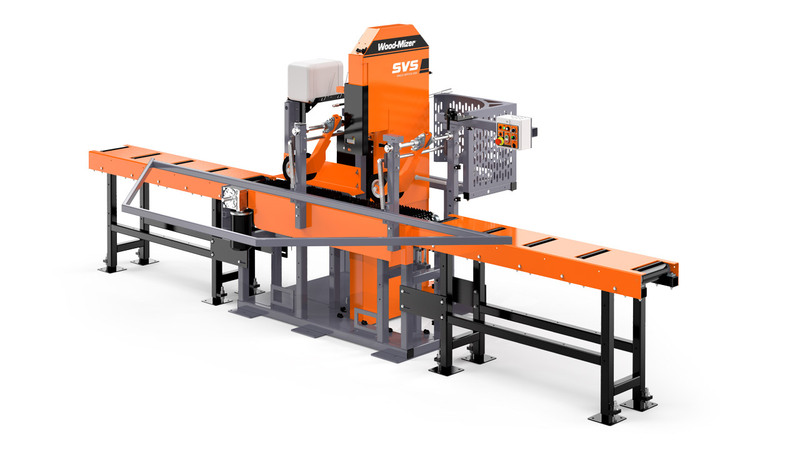 The SVS shares the same head and many individual components as the TVS (Twin Vertical Saw), simplifying blade and spare parts ordering. The spiked steel feed belt carries the cant through the saw at up to 25 m/min. Wide hold-down rollers keep the cant stable during cutting. Align cants for maximum recovery with the standard laser. Infeed and outfeed roller tables available. Uses the same blade size and many of the same parts as the other machines in the SLP line, facilitating spares ordering.